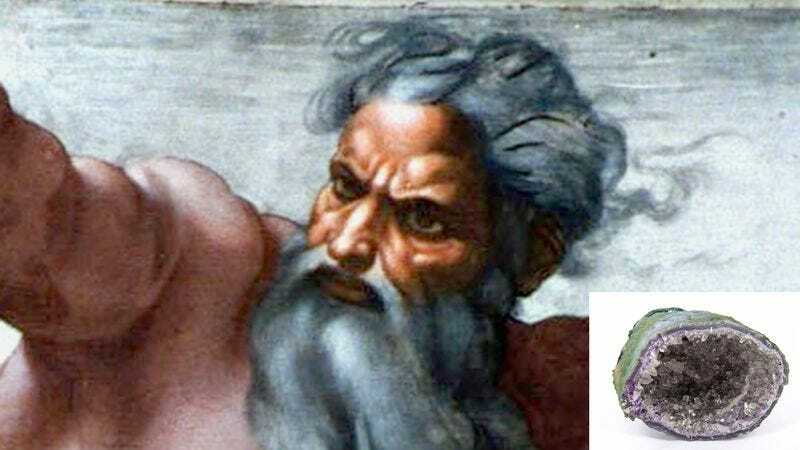 THE HEAVENS—Acknowledging He might be a bit rusty after so many eons had passed, the Lord God Almighty told reporters Tuesday that He was having trouble remembering how to make geodes. “I used to make these stupid things all the time, but now I’m just drawing a total blank,” said Our Heavenly Father, adding that He was kicking Himself for never writing down instructions for creating the crystal-filled lumps of rock. “I’m pretty sure I start with a bunch of calcium. Or is that something else? Oh wait, wait, I think I have to insert an air bubble into some volcanic rock and then somehow do the mineral deposit thing inside? Christ, I feel like I’m missing half a dozen crucial steps. Well, maybe I’ll just kind of eyeball it.” At press time, the Creator of the Universe had abandoned His project three quarters of the way through upon realizing He had been making nothing but stalagmites.